Even Olajuwon looks bigger than Howard who is supposed to be 7 ft.
Wang zhelin and Yi Jianlian should look big standing next to Howard. 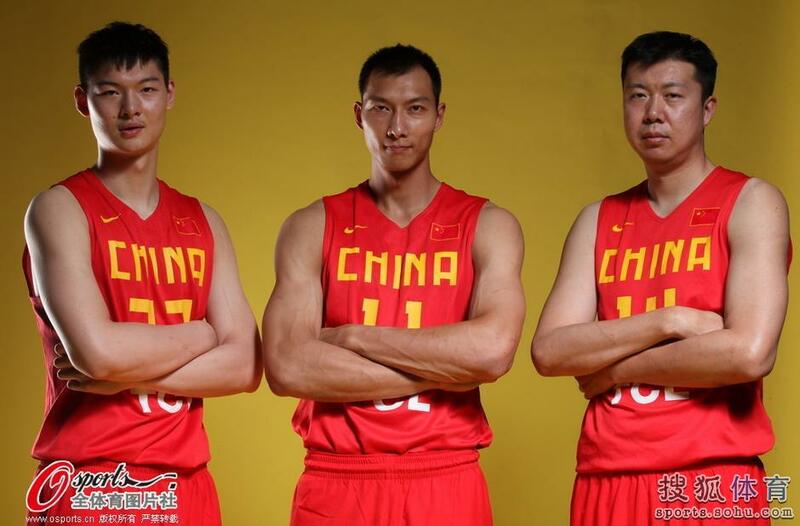 Wang zhizhi and Sun Mingming look big compared with Yao Ming. 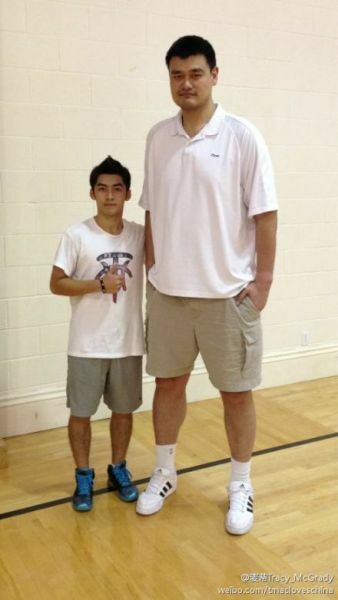 Well, you're just trying to be ATTENTION-WHORISH saying Wang Zhizhi looks BIG compared to Yao Ming. EVERY PICTURE shows Yao Ming is taller, with broader shoulders, and much bulkier than Wang Zhelin, Wang Zhizhi, Yi Jianlian and Mengke Bateer. pryuen, what a moron you are? There is no one here saying Wang zhizhi is bigger than Yao Ming. But when Wang zhizhi is standing next to Yao Ming, he does not look that much smaller. However when Olajuwan and and Howard stand next to Yao Ming, they look much smaller. In the picture of Wang Zhizhi, Yi Jianlian and Wang Zhelin, Wang zhelin does look taller, but height is useless when your arm and finger lengths are not getting longer. The wing span of Yao Ming is a disadvantage for him. We had heard so many rumors that Tracy McGrady and Yao Ming did not get together pretty well as buddies during their tenure at Houston Rockets. They might not be the best of buddies, and both of them were not able to stay healthy enough to really get the most out of combining powers while on court. Yet, despite their difference in character (one is humble, while the other is arrogant and big-mouth), and they are divergent in almost every respect of their lives, yet out of their love of basketball, they seemed to still have mutual respect, and genuinely enjoy playing with each other, and are not really enemies in real life. That bond seemed to have continued even after both have left the NBA behind. 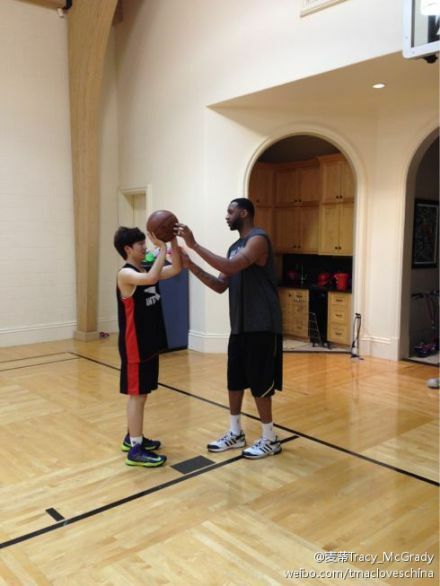 On July 17, Tracy McGrady posted a message and a photo on his Twitter showing a visiting Yao Ming posing with his son !!! And is now in Napa Valley on the West Coast , inspecting on his vineyards, and working on his next wine label: Napa Crest !! Calif. (KGO) -- Retired NBA star Yao Ming has a thriving start-up in the Bay Area. It's just a small Napa Valley winery, but it generates enormous demand and a bountiful return on investment. For Yao, it's another slam dunk -- off the court and in the Napa Valley vineyards. He started his boutique winery a couple of years ago. He leases vineyards and production space at a custom crush facility in St. Helena. His wines are sold almost exclusively in China. The rapidly emerging middle class just can't get enough of Yao Family Wines. They pay a whopping $650 for his reserve cabernet and $150 for his flagship cabernet. "With economy growing, people, they want to experience something different," Yao said. "They drink a lot of wines because of business dinner or something like social mingle stuff." Although the Chinese do consume a lot of wine, it's often the home grown rice wine which can be much stronger. Yao likes western wine because it creates a more relaxed drinking culture. "The red wines is bringing you different feelings about life; slow down, peaceful and enjoy wine with family and friends," he said. Yao's winery produces less than 5,000 cases a year, but now Yao is introducing a new label, the more moderately priced Napa Crest. He wants "Napa" in the label because he wants the Chinese to get to know the wine growing region which he loves. "I want people to experience Napa with wine, food, the weather, everything," he said. Yao's new label Napa Crest will be much cheaper than the cabernet reserve, only $48. They'll be available in the United States next year. A video of Yao Ming receiving the interview from Vic Lee of ABC7 News while touring him around his vineyard. Yao Ming's stay in Napa Valley seemed to be a short one !!! He is back into Houston !!! 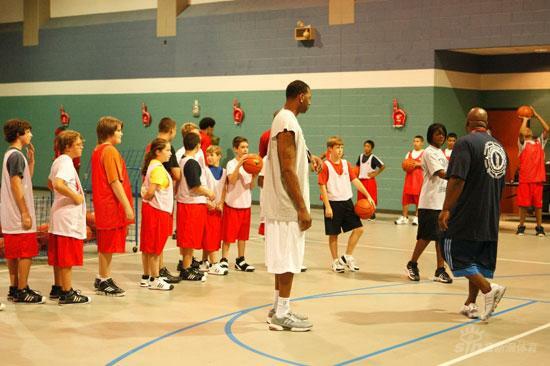 Tracy McGrady is currently holding his annual summer basketball clinic/camp for school children in Houston from July 15 to August 4. And on week-ends, selective participants of the training camp are invited to go to Tracy McGrady's home to have one-on-one sessions with T-MAC in the gym of his house. 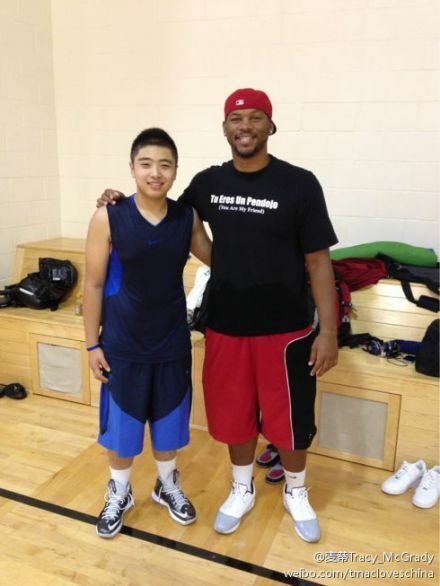 Tracy McGrady posted the following photos on his Twitter yesterday, showing Yao Ming and another former Houston Rockets, Chuck Hayes with participants of his basketball training camp, presumably shot in the gym of his home. NOT SURE WHETHER this happened just these 2 days, or MUCH EARLIER around July 13 when the Houston Rockets held the press conference and fans rally for signing Dwight Howard. There was this pretty interesting article by Jonathen Feigen written on July 21 about a roundtable between Dwight Howard, Hakeem Olajuwon, Ralph Sampson and Yao Ming discussing the Art of the Centre !! !